Vintage Griswold Film Splicer Jr. Model 8 & 16mm Neumade Products Corp.
KODAK PAGEANT AV12E6 16MM SOUND PROJECTOR TOTALLY SERVICED! KODAK PAGEANT AV126TR OPTICAL SOUND 16MM PROJECTOR SERVICED! KODAK PAGEANT AV126TR 16MM OPTICAL SOUND PROJECTOR ' SERVICED! 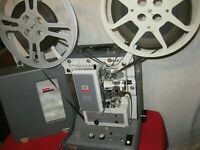 KalArt Victor 16mm Sound Projector + 1 Take Up Reel / Projects great! VINTAGE 16MM KALART VICTOR EASY LOAD MOVIE PROJECTOR- 90-25.